Abu Dhabi: The face of the UAE Special Olympic World Games, Hamda Al Hosani, ended her campaign by adding another silver to her tally in the 4x100 metres relay as the curtains came down on athletics events at the Police Officers’ Club in Dubai on Wednesday. The 30-year-old sprinter, teaming up with Reem Al Blooshi, Momena Shirdal and Fadwa Abdul Qader finished behind Chinese Taipei with a timing of 1:08.08 seconds. She had earlier won gold in 200 metres and a silver in the 100 metres run. “We would have liked to win gold but it didn’t happen. I won gold and a silver earlier so I’m really happy. I will try to work more hard in the competitions ahead,” said a pleased Al Hosani, who had earlier won gold in the 200 metres with a personal best time of 32.14 seconds and later clinched a silver in the 100 metres. UAE paddlers set the stage on fire by claiming two golds, three silvers and a bronze as the five-member contingent ended up winning a medal each; UAE’s best performance at the Games ever. The hosts were perched at fifth spot in the medals tally at the time of going to press with a haul of 179 (61 gold, 55 silver and 63 bronze). 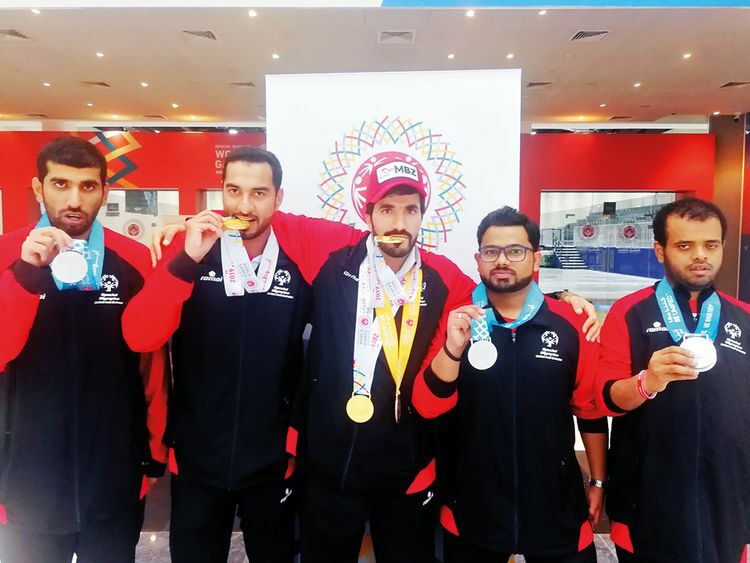 Leading from the front was Khalid Ali Al Shehhi from Ras Al Khaimah who bagged two golds in the men’s singles and Unified doubles teaming up with Faisal Ahmad Abbas. Mohammad Al Mas along with Ahmad Hamad Al Ketbi claimed a silver in the Unified doubles and later also went on to clinch a bronze in the singles. In the Unified doubles, Al Shehhi and Ahmad Abbas made a clean sweep beating Germany, Portugal and Belgium on their way to gold. “It is because of all the hard work that we put in the run up to this event. We were all together for a month now and have been training really hard. A lot of credit should go to Al Shehhi, he has been phenomenal,” said Ahmad Abbas, adding that the performance showed they could improve in any sport if there was a will to excel. The team is trained by Omar Khalil and the boys have been under him for a long time now. “Coach Khalil has to get all the credit. He has been very patient with every one of us and that has worked wonders. Also the family of each one of us backed [us] up and home support was also tremendous. Hopefully, this success will inspire us to get better results in more events to come,” said Ahmad Abbas. UAE basketball coach Hisham Farouq was all smiles after UAE won the Traditional Male/Mixed PLYRD05 final, beating Italy in the final 28-18. UAE was also involved in another final Unified Male/Mixed PLYRD01 against Puerto Rico but had to be content with the silver losing 33-25. UAE’s unified female team was also in the final of the PLYRD01 category against Finland but had to be content with silver after they went down 16-9. “I won’t say the results were disappointing but we should have won at least two golds. The hard work we did allowed to go this far and the competition was tough. We will come back strongly building on this success. I will be working on with more young boys soon,” said Farouq, who has been at the helm of affairs for the past 15 years.